Smörgåstårta is a Swedish speciality and the direct translation to English would be “sandwich cake”. It’s layered cake built with normal toast bread, different types of fillings between each layer and then covered with a outer coating and decorated. You can use whatever you want as filling and after you’ve made my version of it I suggest you experiment with the fillings and decoration. Fish themed sandwich cakes seems to be the most popular but I’ve had sandwich cakes on many themes – cheese, meat, vegetarian – so it up to your taste buds and creativity! Here’s my smörgåstårta with fish in 3 layers, good for about 10 adults. A smörgåstårta should be made minimum 12 hours before serving and stored cold until 1 hour before serving when you take it out into room temperature and add a 2nd layer of coating and decorate it. Build the bread layers in such a way that it will hold together i.e. bread slices must overlap layer to layer. 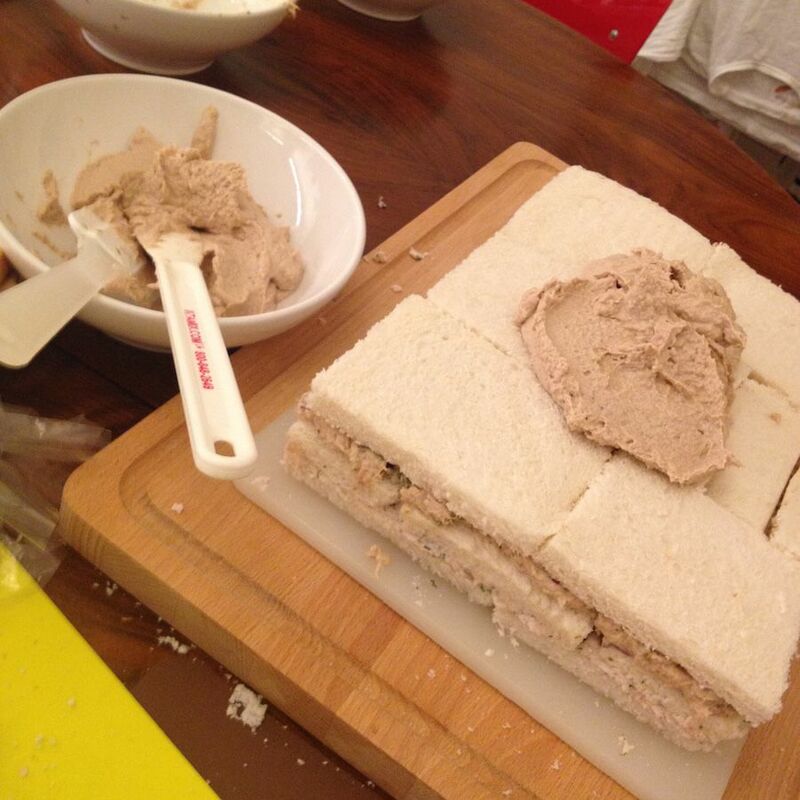 Don’t build so that the splices between the bread slices are vertically aligned – the cake will fall apart. For nice texture don’t use mixer for all the fillings as it makes the whole smörgåstårta too smooth and soft. It’s nicer to eat if one filling is a bit chunkier. 400 g salmon fillet, canned or fresh filets fried and cooled. Mix it all in a mixer. Add some of the oil from the salmon or anchovy in the end to make the mix smooth, or add some of the cream (you need to open the cream for the coating anyway). Chop the red onion and capers into pepper corn size pieces. Add the tuna and mix with a fork. Add the mayo one spoon at the time until you get the right texture. Season with salt and pepper to get the right flavor. I prefer to mix this one with a fork to keep it a bit chunkier than the other two fillings. Mix it all in a mixer. Add the lemon juice in the end until you get the right smooth texture. If you don’t get it soft and smooth add some of the cream (from the coating) or a little mayonnaise. There are many ways of doing the coating but I’ve found that this mix of whipped cream and mayo is the best! It’s the easiest to work with, it has the right stickiness so you can decorate the sides with out it sliding off, and maybe most importantly, it the best taste! Toast bread, if you use the large format of toast bread you need about 30 slices (3 by 2 in 4 layers plus a few extra in case you make some wrong cuts). Cut off the hard edges and lay out the soft toast bread in a 3 by 2 base on a cutting board. Check that you can fit the cutting board in the fridge before you start! Spread the 1st filling evenly on the first layer of toast bread. Add the 2nd layer of toast bread so that you don’t have the splices on top of each other (enlarge the pic on the right so see how I’ve done it). Repeat with 2nd filling, toast, 3rd filling and final layer of toast bread. Add the coating evenly on top and on the sides of the smörgåstårta. Wrap the smörgåstårta in cling film, resting on the tips of the toothpicks, over the sides and under the cutting board and place the whole creation in the fridge for minimum 10 hrs. Take the smörgåstårta from the fridge approx 1 hour before serving and decorate. I start with a 2nd fresh layer of coating. Same as above but you only need roughly half as much as you go thinner. 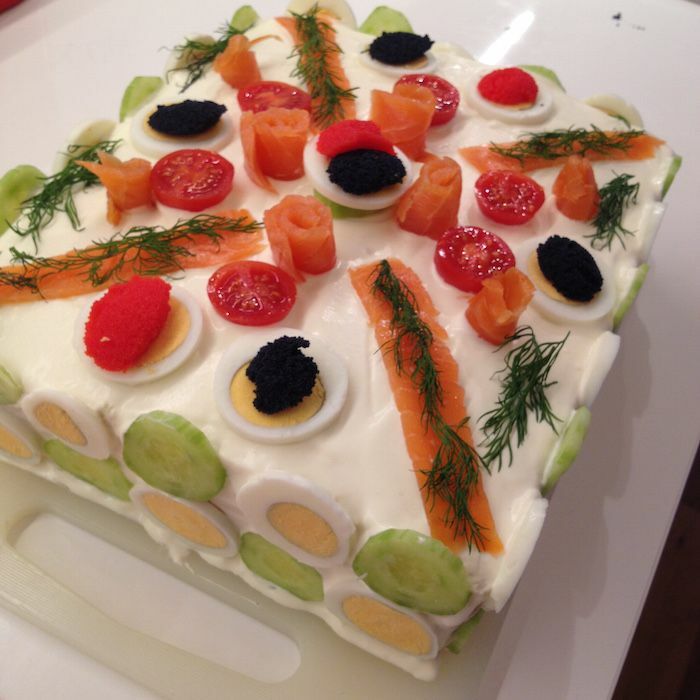 On the smörgåstårta in the picture above I’ve used smoked salmon, slices of hard boiled egg, peeled cucumber, red and black fish roe, dill, and cherry tomatoes. And I added some prawns after taking the picture. Enjoy! And don’t forget to invite me to taste your smörgåstårta!